Urns have long been a symbol of wealth, elegance and distinction, dating all the way back to ancient Greece. Though urns did not always serve as planters, the popularity for using them as such grew over the years, becoming especially popular in the eighteen hundreds. Many styles have come up since then, though the most common and popular style today is still that of the late eighteen hundreds. Urn planters have long decorated the lawns of such gardens as the Charleston Gardens in South Carolina, the New Orleans Gardens in Louisiana, the London Gardens in London, England, and countless other famous gardens throughout the world--not to mention the millions of residences and businesses. 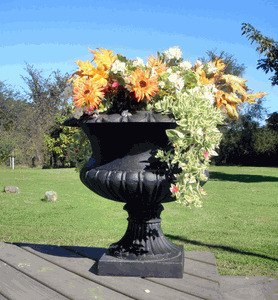 There are several different kinds of urn planters and they come most typically in two general shapes--the rounder, more pot-shaped urns, and the narrower, more vase-like urns--and can be made out of many different materials: stone, a heavier, more expensive option; terracotta, a slightly cheaper, less heavy choice; plastic, which is cheaper than stone, but less likely to withstand any wear and tear it may receive; and resin, which is cheaper and less heavy than stone and terracotta, more durable than plastic, but can still have the elegant look of the more expensive materials. The planters are predominantly seen in more Southern areas, along walkways, driveways, and marking the entrance to houses. They can also been seen topping sturdy brick walls. The types of flowers typically grown in these planters are of the creeping variety, such as: Creeping Zinnia, Million Bells, Trailing Lobelia (all annuals), several different types of Phlox--Amazing Grace, Apple Blossoms, Arctic Dark Pink, Blue, Candy Stripe, North Hills, Scarlet Flame, White, Lavender, and many more. They are typically mixed with a wide range of other flowers. Consider getting a few of these planters yourself, and add to the elegance and distinction of your garden, home, or businesses.